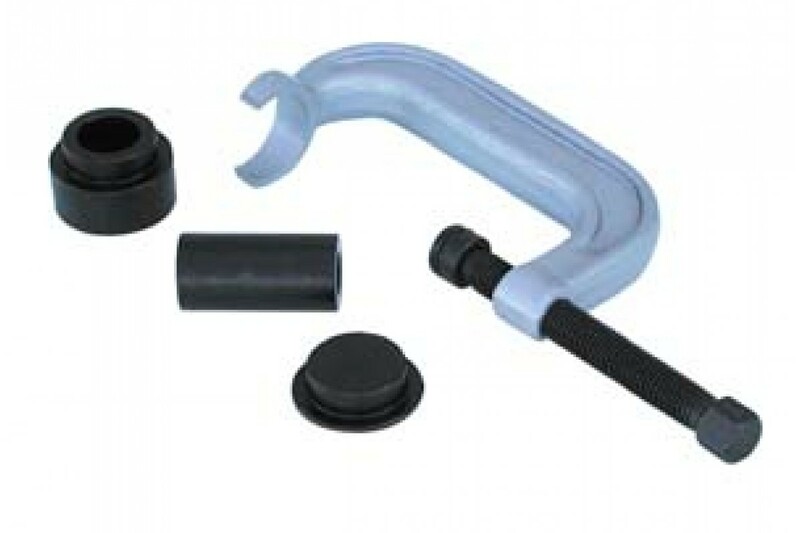 This is a ball joint service tool that seems to be just perfect for pressing out the lower knuckle bushings on Lexus vehicles as well. Its hollow back design allows tight clearance removal and includes a solid plate as well for installation. We found it a great asset on our JZS147 bushing install guide. Sure its more expensive that some import models but it also saves the one resource we can never buy back, TIME. These bushings replace your old aftermarket bushing or stock sway bar bushing with a Superpro .. These bushings replace your old aftermarket bushing or stock sway bar bushing with a SuperPro.. These bushings replace your old rear Lower Control Arm inner bushings with a Superpro Polyure..
Add some positive feedback to your steering with this complete cast poly bushing set. .. These bushings replace your old rear Lower Control Arm inner bushings with a Superpro Polyur.. These bushings replace the staked rubber bushings on the knuckle-side mount of the rear upper .. These bushings replace the staked rear inner rubber bushings on the upper control arm w.. These bushings replace the staked rubber bushings on the Lower control arm. This is the inne.. These bushings replace your old aftermarket bushing or stock sway bar bushing with a Superpr.. These bushings replace the staked rubber bushings on the Front Lower Control arms, rear mount of t.. These bushings replace the staked rubber bushings on the Front Upper Control arms of the SC300/400.. These bushings replace the staked rubber bushings on the inner mount of the rear toe control link.. These bushings replace the staked rubber bushings on the Front lower control arm on the inside mou.. These bushings replace the staked rear inner rubber bushings on the upper control arm wi.. These bushings replace the sealed spherical bearings on the factory arms with new 2 purethane bush.. The last bushing in the puzzle for handling dominance, these bushings replace the staked front inn..